Plum Chutney recipe by Ashi at DesiRecipes.com. Soak plums overnight in water. Heat oil and fry ginger for a minute. 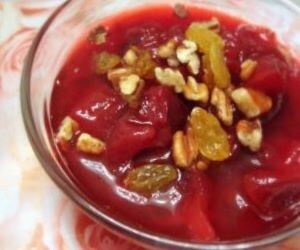 add plums, water, sugar and the rest of the ingredients except for the almonds in it. Cook on slow heat for 15 minutes stiring occasionally until the syrup thickens. In the end, add almonds pour in a serving bowl.